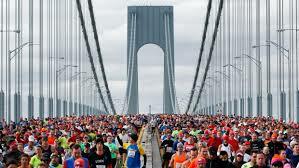 How many people have finished the New York City Marathon in the past 44 years? The answer is, “More than a million” and the millionth runner made history yesterday, earning herself guaranteed entry into the race for the rest of her life plus a shopping spree for marathon gear. Katherine Slingluff of Park Slope, Brooklyn, won this special honor, finishing the race in 4 hours 43 minutes and 36 seconds, more than two hours after the first place finisher in the women’s division, Mary Keitany of Kenya. Keitany won the race in 2:25:07. Slingluff is a mother of two, a photographer, and originally from Alabama. Slingluff said she did not feel compelled to maintain a strict 10-minute-mile pace.